In "The Marked" you play as a fallen Arch-Vile, cast out of Hell by a power struggle and stripped of your powers. You're completely without any direct attack capability, but as one of Hell's former generals you can manipulate and command its minions, gradually reclaiming its armies for yourself. Designed to work with any vanilla Doom level. 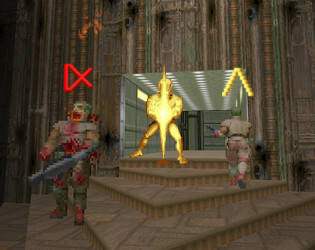 Play through Ultimate Doom, Doom 2, and Final Doom's campaigns for a parallel story chronicling your quest for revenge. I made this prototype in 2016 to prove out the idea. All visuals are placeholder. I'd like to return to this someday with a revamped design.